Vroom, Bang and Upside Down. Under the Rainbow at the Salt Marsh. It was that time of the year again. Super boat championship races on the Gulf. Practice runs on Friday and Saturday and the races on Sunday. 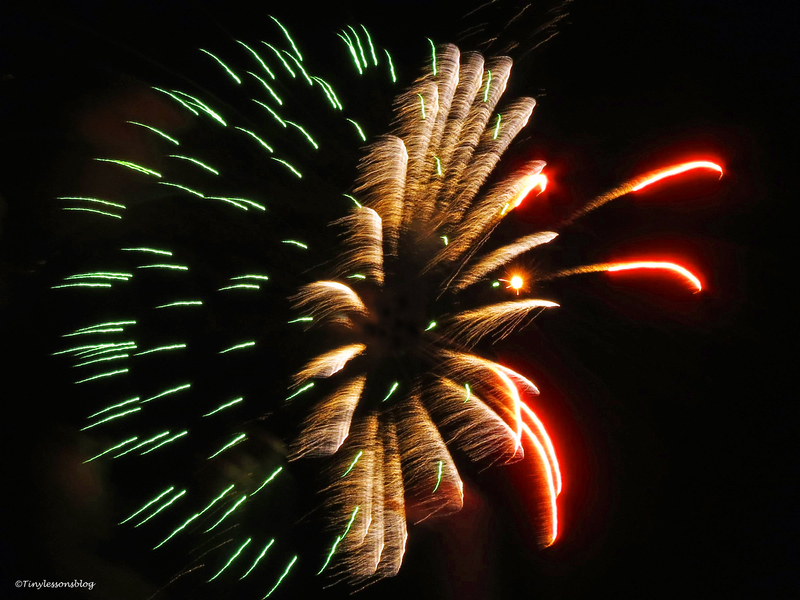 Tens of thousands of spectators, parties everywhere, and fireworks on Saturday night. Engine roar and fireworks bangs just a stone throw from the salt marsh, and my terrace. I guess the permanent residents at the salt marsh are by now used to the volume and the colorful night time lights generated by this annual three day event. Mama Sandy certainly took it all in stride. She was focusing on her fascinating gardening project. There’s even more green in the nest now than three weeks ago when she started planting. It is, indeed, an impressive looking garden. I’m thinking she might want to create the look and feel of Papa Stanley’s resort. It’s certainly starting to look like that. I have no idea how she does it. But she looks proud of her achievement, don’t you think? 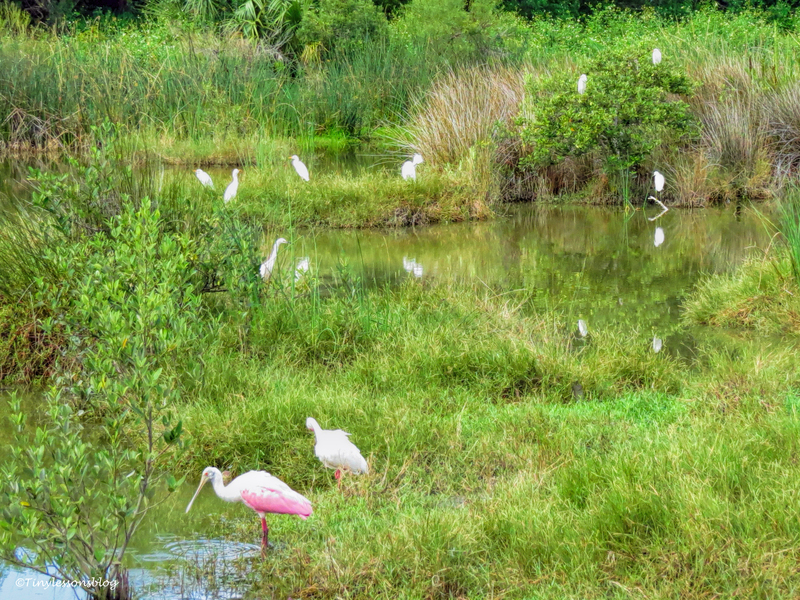 Despite all the hubbub, the marsh has been lively with birds. Lots of white sprinkled with pink, blue and brown. The water levels are up again after recent rains that have also given us multiple beautiful rainbows over the bay in the last few days. 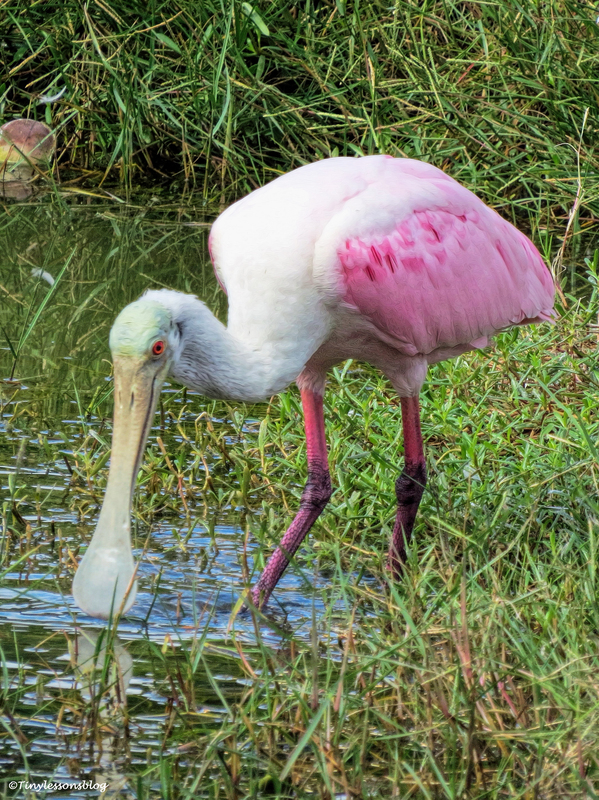 Rosa, the Roseate Spoonbill, and her friends ibis, egrets and herons have enjoyed foraging in the previously dry spots. 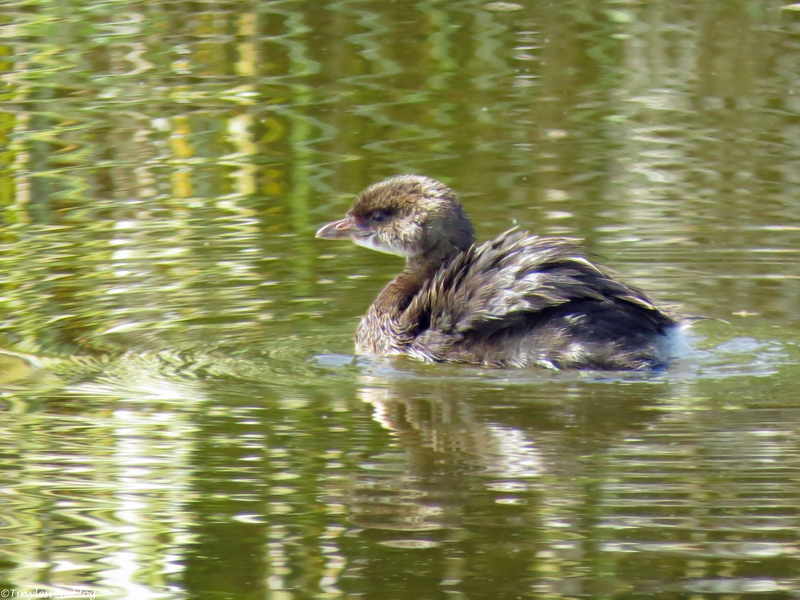 This juvenile Pied-billed Grebe is a newcomer at the salt marsh. I’ve not seen any other family members so I’m thinking this little one must have migrated on its own from up north. 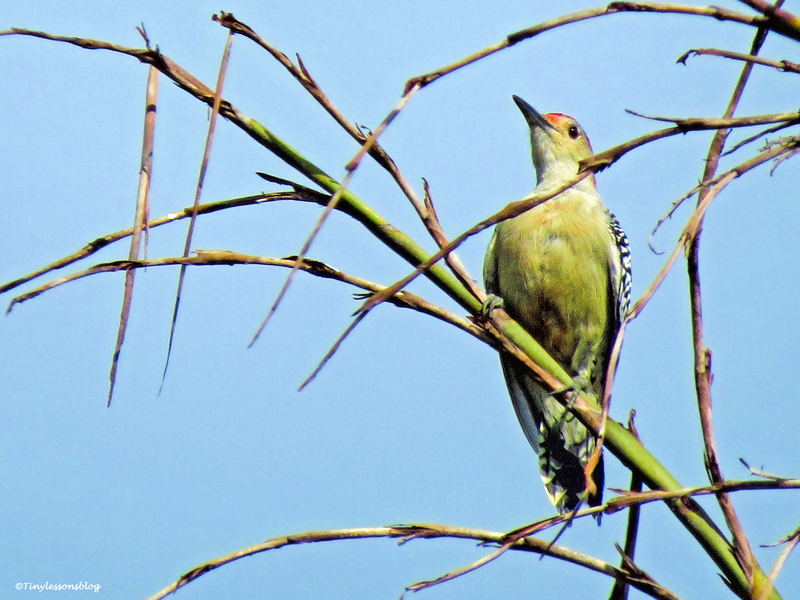 This past week, I also spotted the Red-bellied Woodpecker again. He has returned from his summer adventures. He was hanging upside down and his red head was moving fast in search of breakfast. Every now and then he’d interrupt his work to scan for any dangers. His sweetheart was with him too. She was too shy for a photo shoot, but he posed gladly for a second one. I wondered what they might have thought discovering their old home, the “condo building”, was gone. 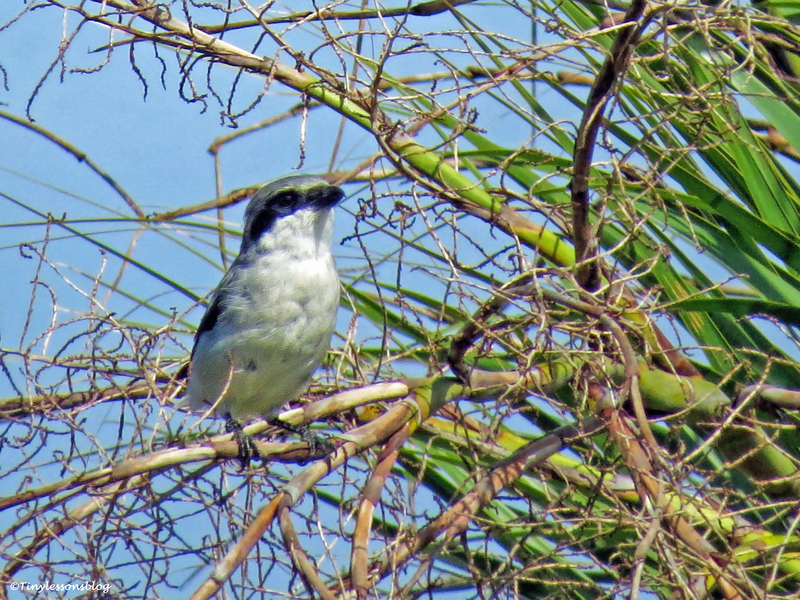 Close to the woodpeckers, I spotted a Loggerhead Shrike and a Northern Mockingbird. 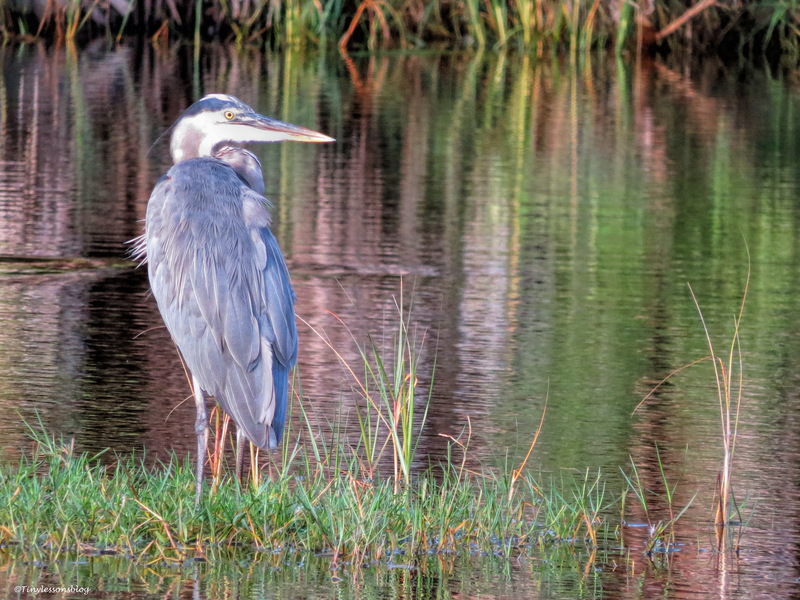 Both are permanent residents in the forests next to the marsh. I had not seen Papa Stanley for days so I decided to walk to his resort, hoping he would be at home. I was lucky. He had just returned after taking a bath. He shook his wings to get rid of the water, and then spread them out to dry. I was happy to note he seemed to be in great shape. So everybody in the extended salt marsh family is accounted for, and we all wish you a great and safe weekend. Love, love, love the rainbows! 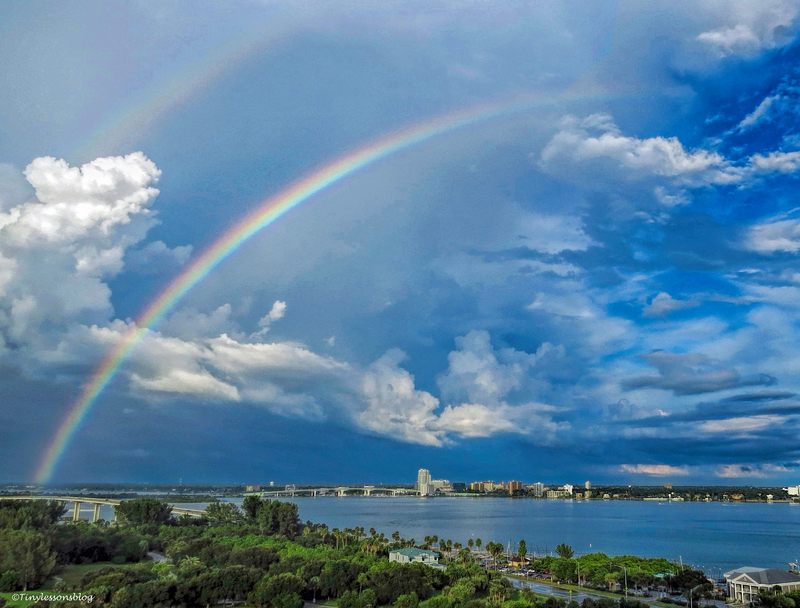 Happy you liked them, Cyndi.The whole rainbow is the first one I remember seeing over the bay. Thank you tiny! big hugs! Great tour of your neighborhood friends! It’s great that you enjoy them, name them & know them. Is this the gulf coast? Glad you came along for the tour, Brad! Yes, we are on a barrier island on the Gulf coast. 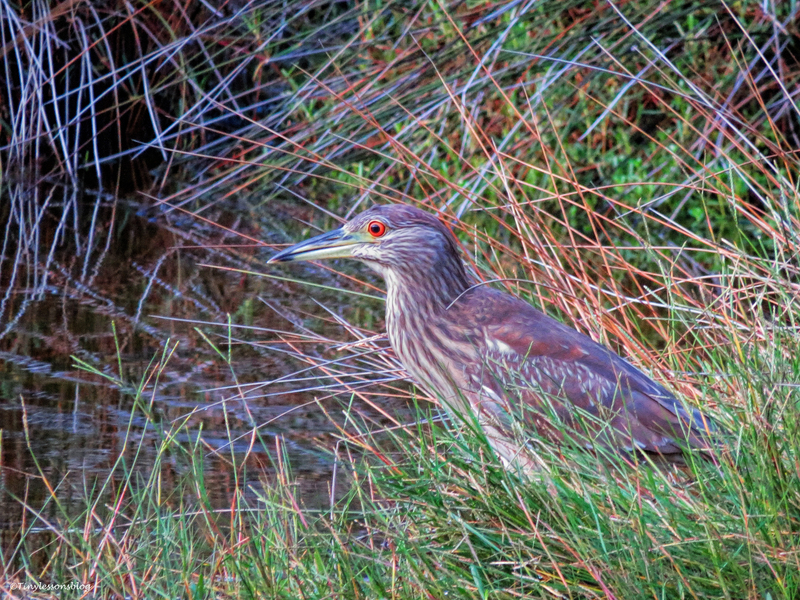 The salt marsh has my favorite walking trails and houses my favorite photo models. Mama Sandy’s garden truly is becoming a thing of beauty! I always love how many different birds you share with us in your posts. The rainbow photos are sensational! I’m amazed about the fact that all Sandy’s plants stand upright, don’t fly away in the wind and don’t seem to wilt in the sun. The whole rainbow was truly gorgeous, the first I remember seeing over the bay in five years. Happy you liked them! That rainbow is the best I’ve ever seen. It must have looked magnificent over the bay. Good for you for checking on your salt marsh family. Thank you! I was sitting and working in my office when I looked up and saw the bright left side of the rainbow, ran out to our terrace …and saw the whole thing. It was mesmerizing! Lasted about five minutes before the right side faded away. Love the rainbow shot Tiny! So glad everyone is accounted for and managing the vroom bangs!! Vroom, indeed, Tiny. So much excitement, And those rainbows. 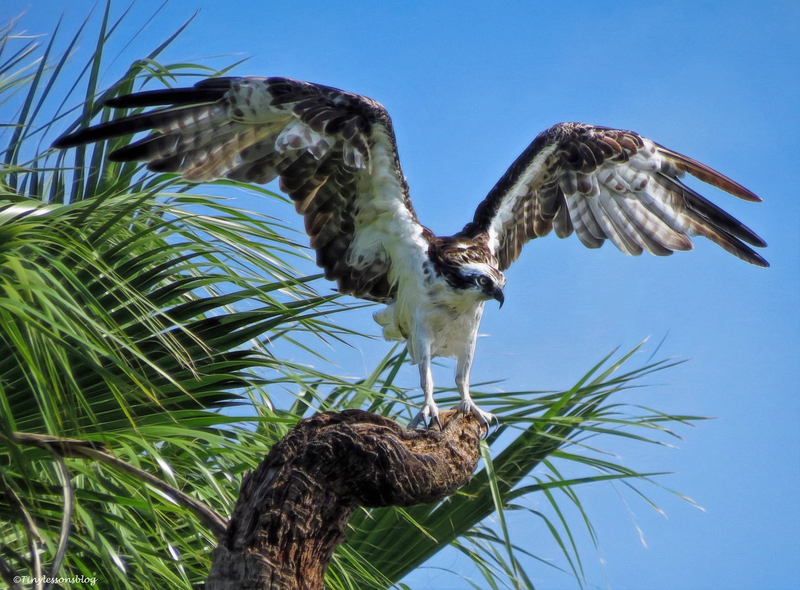 But most of all, what’s with the osprey gardening? This is magic on a whole other level. That was excitement enough for one weekend! 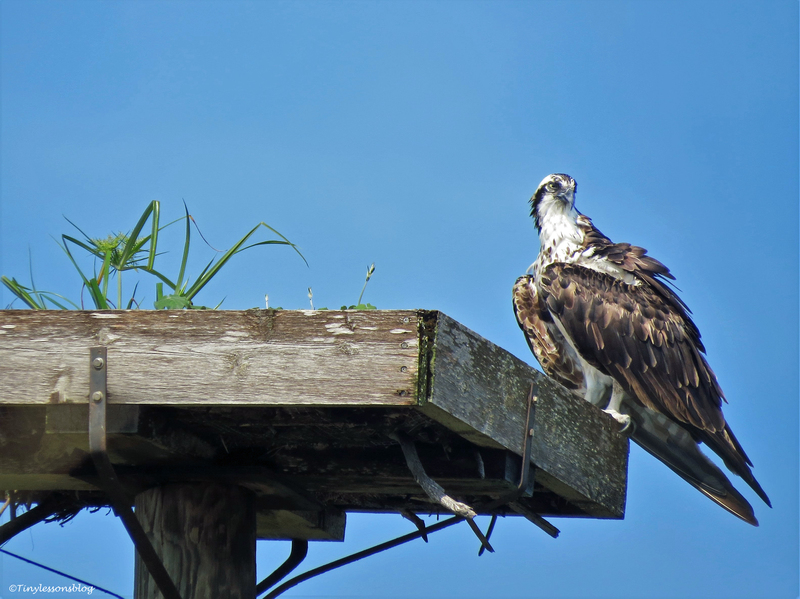 I’m also amazed at the osprey garden…looked at the nest through my binoculars this morning, and it looks like she’s added to her garden. 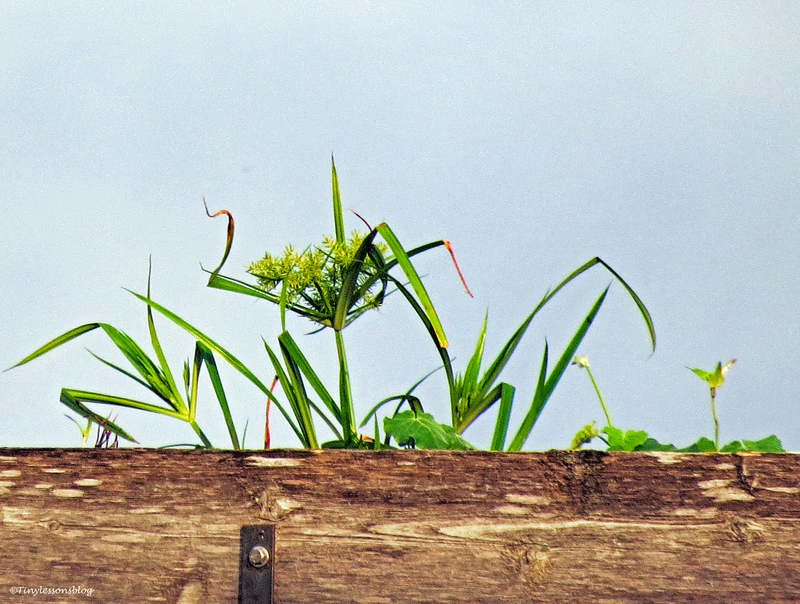 Now something green hangs out over the edge too. She sat there enjoying it all. Glad you found everyone at home despite all the noise there has been. Loved all those rainbows. Thank you Susan. The rainbows were truly lovely, and rare for me to see one that has the whole “bow”. Mama Sandy’s garden is incredible. Maybe she wants some shelter and shade for the next nesting season. Sandy keeps adding to it. This morning there was even more (seen from our terrace). The plants are in the middle of the nest so they are exactly where the nest cup will be…maybe she wants some dried soft materials embedded in the middle before they build the nest higher again in January. That would be very clever. In any case, it’s fascinating. Are you able to get higher in your building? To a roof top, for example, so you can get a bird’s eye view of the nest? What a beautiful place to live and the photos are wonderful. I particularly like Mama Sandy’s state-of-the-art nest! Thanks Julie. Mama Sandy’s nest just keeps getting greener. I’ve seen her do this before, but never more than one plant at the time, now there are at least three different ones. Another wonderfully told story Tiny, and it is great to see your neighbours all doing well, and all looking to beautiful in the salt marsh. Wow that Osprey garden is looking really great, who would have thought??. An interesting fact we have noticed about Grebes is that you seem to always see them alone, unless breeding, this is the only time I have ever seen Grebes together. It is often that we find one lonely little Grebe in the centre of a pond or lake. 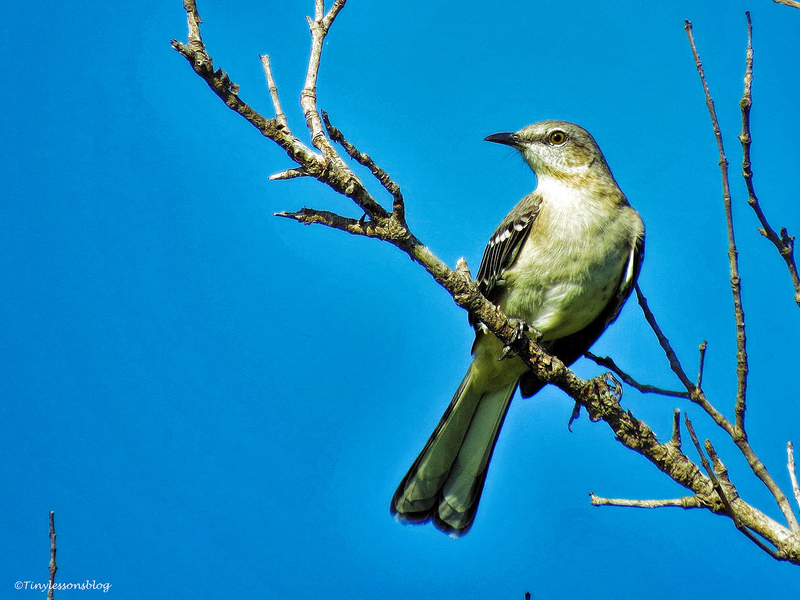 Have a great weekend from the Aussie birds and birder! The garden is truly green now, and I can no longer see with naked eye if Sandy is in the nest or not, have to look through binoculars to see her amongst the plants 🙂 Thanks for the facts about Grebes. This little one has been there alone for a few days now. 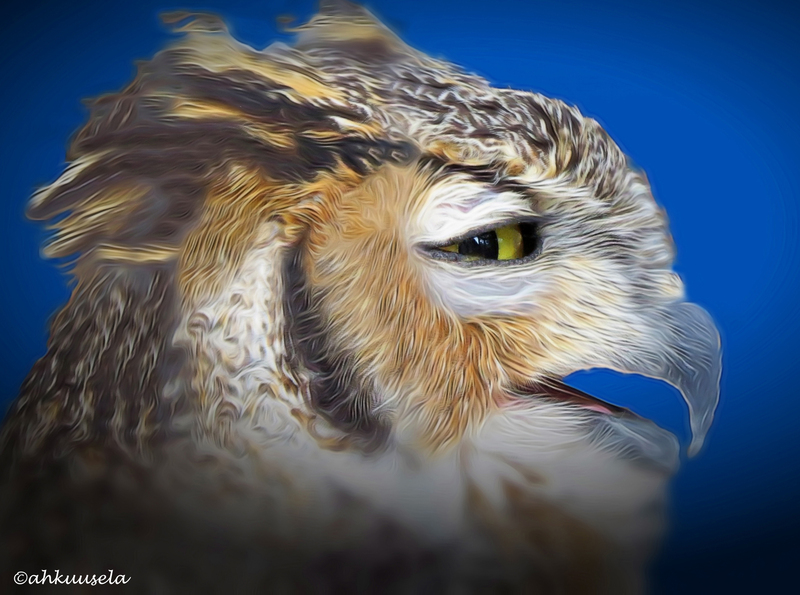 We all wish you all a beautiful birding weekend with many gifts! Glad you enjoyed them, Kathy! I did too, just wish they would last longer. Lovely shots. Hope the woodpeckers find a new condo before nesting season. I want to move where you are and just look at the birds all day. And that rainbow shot is incredible! You’re welcome here, plenty of space, and a nice welcome committee 🙂 That rainbow was amazing, it only lasted about 5 minutes until the right side faded away. Thanks Joanne. Miss Rosa asked me to select that bigger image just for you 🙂 Have a good one! Another comment praising the photographs and wondering at the beauty of the rainbows is superfluous so I won’t put one in. I’m happy you enjoyed. Have a great weekend, hopefully good weather for all your adventures. Your photos are so beautiful! They draw me in so much that I simply want to join you in the marsh! 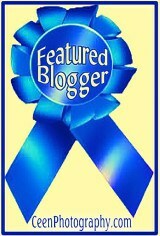 Thank you for sharing your wonderful experiences!!!! Super photos! I always feel for the birds when loud noise invades their space. I do too. But when I visited them on Sunday morning, they seemed to be just fine. Those rainbows just made my day, Tiny. So beautiful. And such a lovely post. Thank you Tahira! I know you appreciate everything beautiful I nature. Have a wonderful weekend. 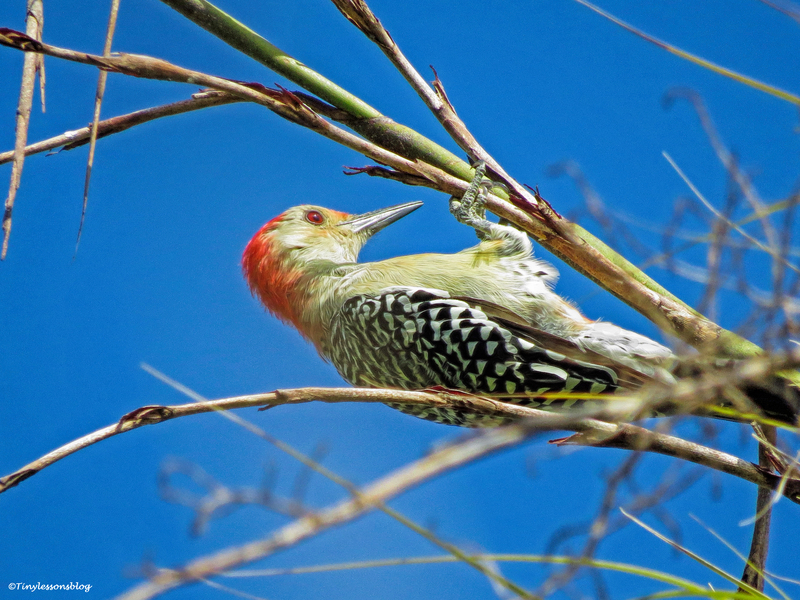 Red-bellied Woodpecker…he is adorable! Love him hanging upside down! BTW….for some reason you are not showing up in my reader! Big sigh…..have a great week. The Woodpecker doesn’t seem to get dizzy while hanging upside down. I’ve also noticed that the WP Reader sometimes drops those I’m following, so I have to follow them again. Several such occurrences lately. Have a wonderful week Laurie. Mama Sandy has become a gardening enthusiast lately. Even this morning she was sitting there among her greenery 🙂 Thanks Amy! Glad you liked them, Shirley! Your photo of the great and whole raibow is just stunning – a real winner-shot!